How much does it cost to travel to Mexico? How much money will you need in Mexico? M$936 ($50) is the average daily price for traveling in Mexico. The average price of food for one day is M$213 ($11). The average price of a hotel for a couple is M$956 ($51). Additional pricing is in the table below. These average travel prices have been collected from other travelers to help you plan your own travel budget. How much money do I need for Mexico? 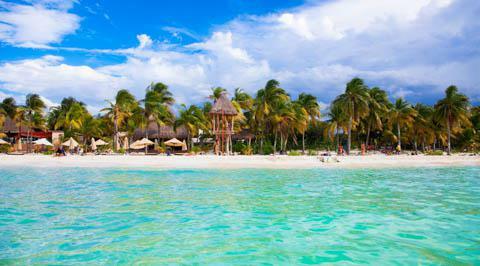 Mexico is a convenient destination for Americans and Canadians looking to find warm weather and tropical beaches. For decades, this country has been popular as a spring break destination. College kids head to its beaches to cut loose and have fun. Popular cities like Cancun, Cozumel and Acapulco have long been the destination for American youth looking to have a good time, but while Mexico is known for its beach resorts, there really is so much more. If you take the time to head inland, you can explore its villages and cities. From the mountains, to the tropical beaches, to the jungle, there are plenty of undiscovered areas still to be found. Hit up a festival. Drive through the countryside. Stop by an undiscovered restaurant. Get off the tourist trail and you'll see this country has so much more to offer. Mexican food has spread throughout North America. Everyone craves tacos, burritos, and enchiladas, but nothing can top the experience of eating the food in the country where it originated. Food stands abound in most cities and towns. The food is typically quite fresh and delicious and when you're on the coast, seafood is the most common food of choice. Mexico can be an expensive destination, particularly if you stick to the resorts and package tourism areas. If you venture a little farther off the beaten path then you'll likely save yourself a little money while you have a more adventurous experience. Stay at locally owned hotels and skip the large resort options and your money will go a lot farther and stay within the local economy. Likewise, restaurants that are targeted specifically at tourists are often far more expensive than local options. Stick to where the locals eat you you'll save yourself a good amount of money. Also try picking up some food in the markets. The food is often fresh and far cheaper than the options that are available in sit down restaurants. Also remember to negotiate prices. This is particularly true with taxis. Drivers often refuse to use their meters, so you'll do better to agree on a set price before you even get in the vehicle. If you're going to spend any time on the Caribbean coast you are better off avoiding the hurricane season, which is during the fall months. If a hurricane hits the area during your scheduled trip you'll almost guaranteed to have to cancel. If you do decide to travel during this time make sure you have good travel insurance. Many of the best roads in Mexico are toll roads. These roads are usually in good condition and allow for the shortest travel time. You can expect to pay anywhere from 400 to 800 pesos to travel on a toll road with a private vehicle. If you're taking a bus, only the more expensive buses use the toll roads, as this fee is included in the price of your ticket. If you're traveling between cities by bus, you want to take the express bus. These buses are called directo throughout the country and they are much faster and more efficient than the local options, which stop in all of the small towns along the way. If you have money that you want to exchange for Mexican pesos it is best not to do this in your hotel. The rates in hotels are usually outrageously high. There are often places around town where you can exchange money. If you have a banking card, ATMs almost always give the best rate, but this does vary by bank. There are any number of activities to do in Mexico. On the coast you can enjoy surfing, scuba diving, snorkeling and kayaking. It is best not to make any arrangements until you arrive in the country as the prices will be a lot less. Many hotels can organize activities and tours, but ask around because the rate is usually higher outside of your hotel, particularly if you're staying at a resort. Dias des los Muertos: Head to this festival in Oaxaca for one of the best examples of the Day of the Dead Festival in Mexico. It is celebrated at the end of October and is a time when Mexican families remember those who have died. Gifts are often left on graves and prayers are said for those who are deceased. Palenque: This archaeological site in Chiapas, although smaller than some other sites throughout the country, is a wonderful example of Mayan architecture. It dates back to 100BC and is and impressive sight to see. Copper Canyon: This is a network of canyons that, when combined, are larger than the Grand Canyon. They are located in the southwest portion of the state of Chihuahua and offer stunning views and breathtaking scenery. Mexican food has a lot of regional specialties which you will become familiar with as you travel through the area. In the north most dishes are meat based, and many of the options are influenced by American cuisine. In the central areas most dishes are corn based while in the southeast they are spicier and made with chicken and vegetables. Along the coast you will find a lot of seafood options. Tamales: Tamales are a corn and meat based dish that is either steamed or boiled in a leaf wrapper and served with sauce. It's popular in most Mexican restaurants and makes a good lunch or dinner option. Quesadillas: Quesadillas are a flour or corn tortilla that is typically filled with cheese and a meat or vegetables. They're common throughout Mexican and are also available in most restaurants abroad as well. They're a simple dish to prepare but can be quite good. Tacos: Perhaps the most popular food option, tacos are made with a corn or wheat shell that is filled with meat or beans and served with cheese and vegetables. You can typically pick up several at food stands anywhere in the country for a very low cost. They're a great option for a filling but cheap lunch. There is some concern about safety in Mexico so it is important to keep your wits about you and make smart and educated decisions. Monitor warnings to insure that the area you're traveling to is currently safe and stable. When you're in a city, stay closer to the downtown areas, particularly when you're out and about at night. The Plazas, Zocalo, or Jardin tend to be more crowded and therefore safer. Avoid being alone at night and be aware of the neighborhood you're in. If you make smart decisions, Mexican can be an incredibly safe destination.